After a prolonged struggle I managed to lever it out; the state of the roots were, frankly, shaming. Sorry, sorry – so sorry. I’ve now re-homed it into a nice new roomy pot. Really, I’m so sorry. Forgive me? I haven’t been so inattentive with all of my plants. Honest. For example, back in the Spring, my good friend David (his real name and such a pretty one) very kindly gave me some tree echium seedlings. 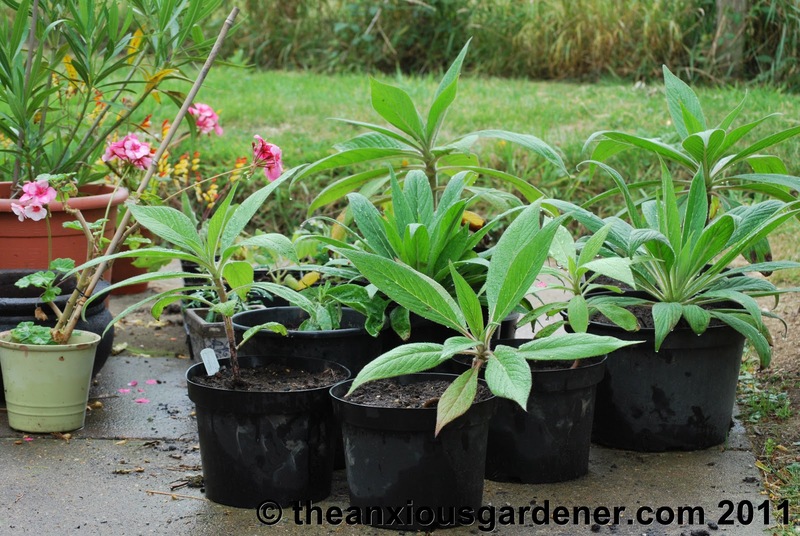 At about the same time I sowed some echium seed of my own and managed to raise four to a decent size. Along with the plants from David, I now have eight of them. Every few weeks throughout the summer, I’ve potted them on as their roots (very quickly) filled their pots. Do you know Echium pininana? I first came across it some years ago in Cornwall. I drove past one growing out of a crack in the pavement and, as it towered some twelve foot into the air, I had to pull over and investigate. 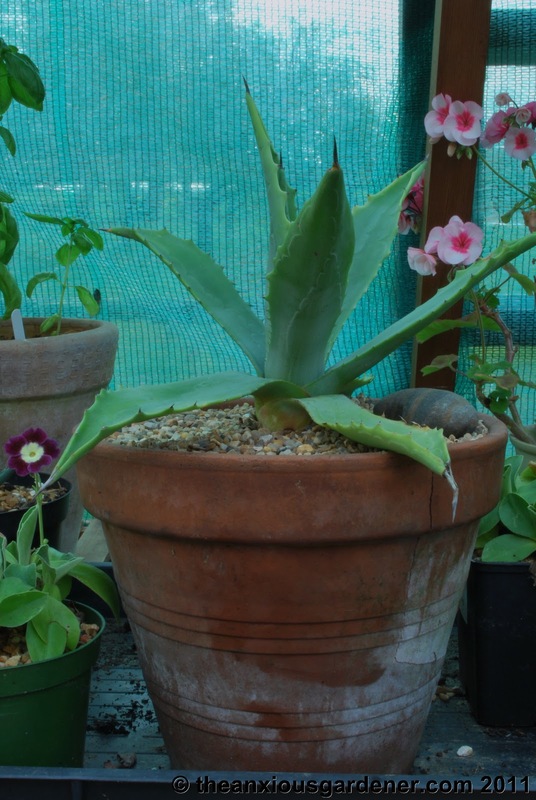 They are biennials and in their second year throw out an incredible, an amazing and really quite preposterous flower spike – up to eighteen feet long! Eighteen feet long and smothered in blue flowers. Imagine that! I’m hoping that next year my eight plants will each launch their own infeasibly long flower spikes. The Marsden Echiums stored away for the winter. (Sorry about Solo the Terrier hogging the shot. Lift a camera to your eye and she sprints into shot and strikes a pose. Like working with Lady flipping Gaga). The problem is they are not hardy so I shall need to overwinter them in the Priory greenhouse. What concerns me is that next Spring, when I plant them out, will they have sufficient time to put out enough root to support such a long flower spike? Won’t it just be “T-I-M-B-E-R” at the first puff of wind? I guess we’ll find out, eh? Having squirrelled away my eight precious plants into the greenhouse, I dreamed of a bank of tremendously long blue flower spikes towering over oohing and ahhing visitors. A few days later, I was at the Old Forge and was busy pruning a bay tree and almost trod on an … yep, you’ve guessed it. An Echium. Obviously, the previous owners had grown them and this one had self sown. The Old Forge is only a mile or so from the South Coast and the plant is in a very sheltered position. I’m going to hope (against hope) that it will pull through this coming winter and flower next year. Without protection. Big hope. I may try and drape it with horticultural fleece through any really sharp frosts but they are difficult to protect long term with their large, floppy leaves. I have my fingers crossed and would ask, politely, that you do the same. Thanks. 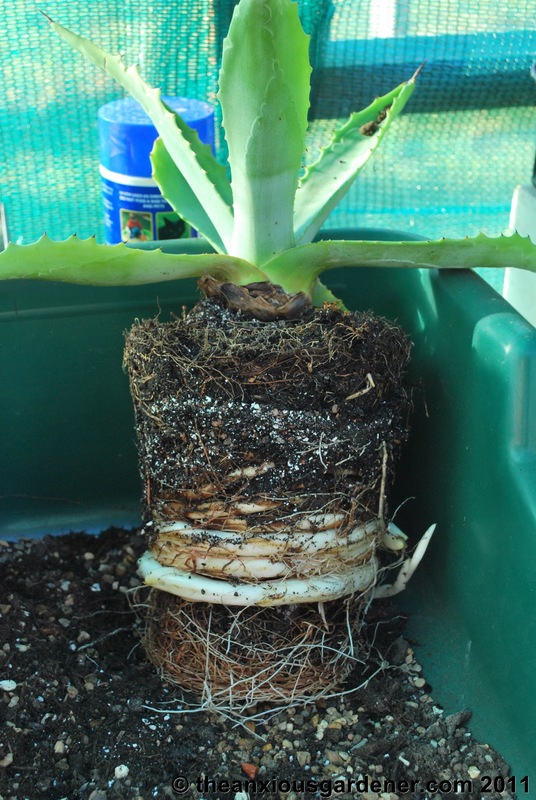 Does anyone know the size of the root system of Echiums… Are the likely to damage the outside drains of my house? Many thanks David. Much appreciated. Hi Anonymous of Anglesey, the greenhouse where they'll be overwintering is heated and they are continuing to grow at the moment. Was wondering whether to repot even now. I have noticed the dropping of lower leaves so have been upping the watering – thanks for the tip. So I need to plant them out very early, eh? OK will do. They will be going against a south facing wall so hopefully will be alright. Thanks for dropping by and commenting. Ha! I saw your echium in one of your posts and was unsure whether it was in a pot or not. I'm guessing it was if you moved it into a greenhouse – hope it recovers. 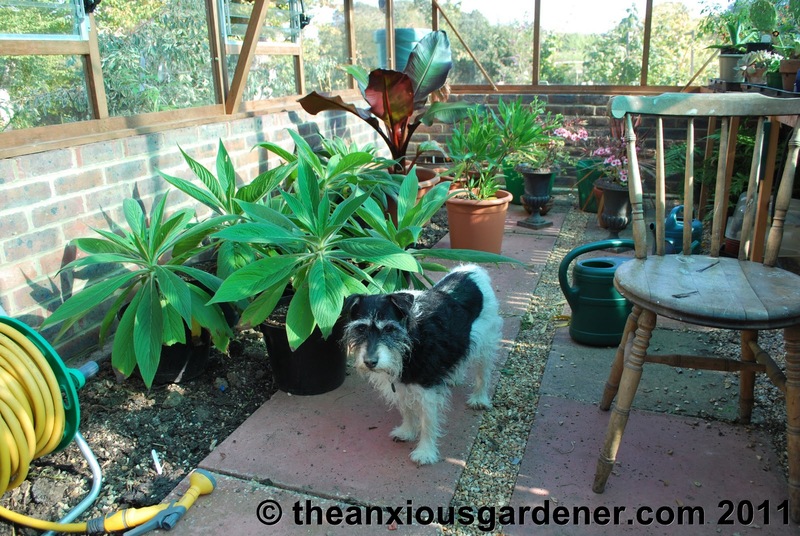 Since I wrote this post, I've discovered several bright green caterpillars munching themselves dizzy on my lovely echium leaves. Lots of damage but hopefully they'll pull through. As though they haven't enough to deal with. Grrrrr. Interested to hear how yours gets on. I love this echium! The problem as you said it, is that it's not too hardy… I've got a 2 year old one that didn't flower this season and is half the size of my vw golf. Brought to the greenhouse I work at for the winter, but the second the weather changed it flumped down looking miserable. Unsure if it's dead, but it's certainly not happy. You're telling me a industrial sized greenhouse with all the trimmings isn't enough, give me a break echium! You have me bang to rights, Petra. I'll come along without a struggle. Be warned, next time I will have no choice but will need to call in the rightful authorities to have you swiftly arrested for the crime of over-pot-bounding your plants… !!! Lovely plant. When in bloom, it's one of the few I can actually look at without having to bend over. Am 6ft3. The problem I now have is time, Janet. Potting on was something I used to do on wet Sunday afternoons in my own greenhouse. Now that I haven't got one and all my tender plants are at the Priory, I have to make time in the working day to do stuff like this. Or repot en masse when it's lashing down outside and I can just crack on with radio turned right up! 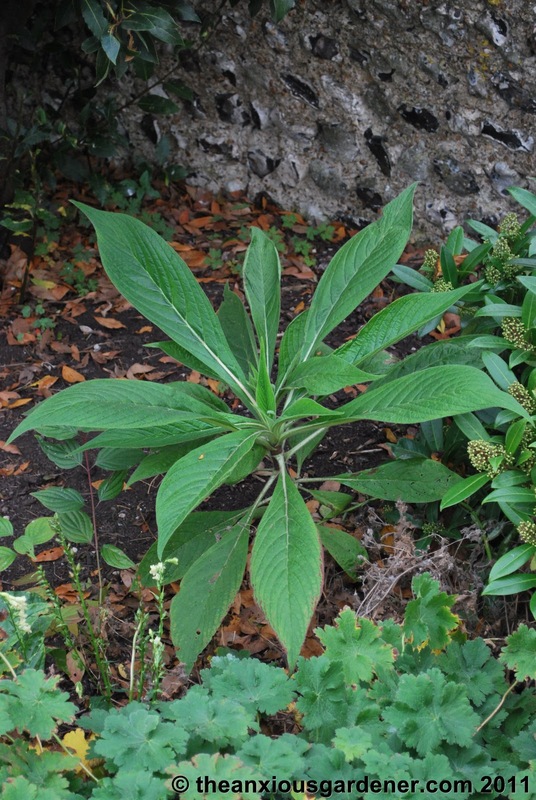 Hi Luton Boys, I have read how once they've flowered, I'll get self-sown echiums everywhere – but I do wonder. The Priory sits in such a harsh frost pocket and plants that used to sail through winter up in my garden on top of the hill, falter and die down in the valley e.g. ceonothus, olive. But hopefully you're right and the echiums will evolve into a super frost beating strain! Interesting Helen. I suspect that because it hasn't flowered it will still try and do so next year – and then die. It's the flowering that is the trigger (to die) rather than living through a second summer – or so I believe. I have one of those Echiums given to me by a friend last summer and I have neglected it and forgotten it and it is just sitting in a pot. I suspect the problem is that I havet potted it up. I wonder if I overwinter it in teh greenhouse it will be OK next year despite being a biennial? David, they say get it to flower at least once in your garden/the priory and you're sorted for Echiums for many years to come, self seeding and even coming up from unexpected places. All from that one flowering episode. Hi Faisal, it will be gratifying if I can get them to flower. They should be snug as a bug in a rug in the greenhouse. I would say that no-one would be so mean to snap off a flower spike, Stacy but then when Jim worked for the police he was called out by an elderly lady whose entire, extensive display of daffs had been ripped up overnight. What's that about? Solo would agree re meat dress though she's happily chewing on a carrot as I type. Strange dog. You're on Janet. If you're trying all the way up there, the least I can do is to get mine to bloom in balmy Sussex! Happy that my failing has pleased you Karen! Lots more potting on to do on the next rainy day. The bees love them – the echium that is. 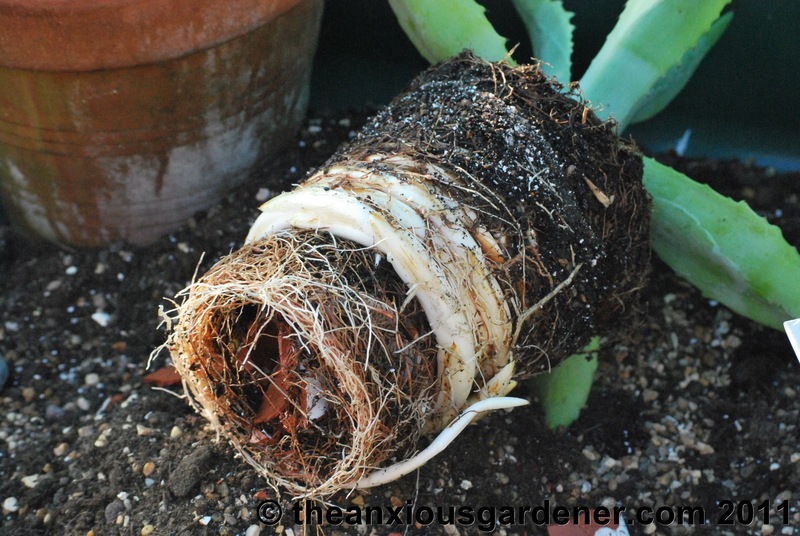 So happy to see your root bound Agave – makes me feel that I am not the only one who sometimes forgets to pot-on quickly enough … I am always saying sorry to my plants! I grew some giant echium from seed (can't remember which one offhand)and I only have one left as I gave the rest away. So I'll just have one shot at the flowerspike next year. You've reminded me to put it away over winter. We could compare heights and how quickly they blow over…. One of my neighbors had an agave in his front yard right next to the sidewalk, which sent up a wonderful bloom spike. Within two days either the wind broke it in half or someone mean did–really heartbreaking (in the gardening scale of things). I had no idea their roots were so thick and fleshy–no wonder yours just about crawled away. Solo would make much better use of a meat dress than Lady Gaga, somehow I feel sure of it. 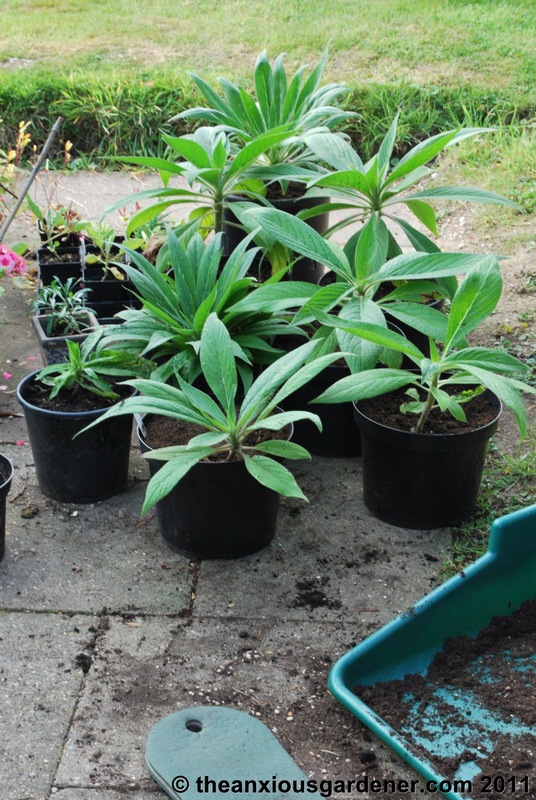 How gratifying, Dave, to grow your own Echiums from seed…wonderful plants. I've got a couple of species – not that I have a clue about their botanical names – and what I know is they don't like being wet AND cold.